At age 88, he’s Cuba’s elder statesman. A legend in his own time and then some. Defying critics. Outwitting them. Outliving them. This article a snapshot of some of his achievements. Impressive by any standard. On the 50th anniversary of his July 26, 1953 Fort Moncada attack, media scoundrels pronounced his revolution dead. Expected collapse. Predicted free market capitalism’s return. The bad old days called good. More on Cuba under Castro below. A previous article discussed America’s master plan for world dominance. Key is eliminating all sovereign independent governments. By political, economic or military means. Installing puppet regimes. Convenient stooges. Subservient to Washington. Few nations challenge US policies successfully. 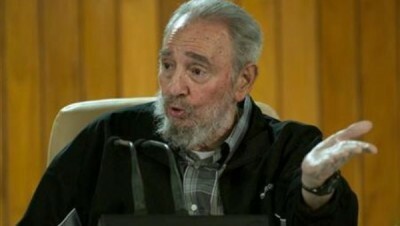 Fidel Alejandro Castro Ruz bested 10 US administrations. From Eisenhower through George Bush. From January 1, 1959. When his guerrilla force ousted US-backed Fulgencio Batista. To his February 2008 retirement announcement as Cuba’s president. Remaining Communist Party Central Committee First Secretary until April 2011. In the interim, transforming Cuba from a repressive brothel to a populist state. Defying US imperialism successfully. America ruled Cuba as a virtual colony. From President McKinley’s so-called “liberat(ion)” from Spain. To Castro’s successful 1959 revolution. A transformational event. Other than America’s Guantanamo footprint. Ceded through Platt Amendment chicanery. Granting Washington “complete jurisdiction and control.” At the same time recognizing Cuban sovereignty. For nearly half a century, Castro’s achievements were remarkable. In spite of America’s embargo. In place since October 1960. Despite longstanding embargo, blockade conditions weren’t imposed. Except in 1962. Under short-term missile crisis conditions. Preventing missiles from arriving. Early-on, Castro made a clean break with predatory capitalism. Nationalizing US-controlled industries. Instituted land reform. Shuttered Mafia-owned casinos and brothels. Ended longstanding systemic corruption. Built a socialist state. Ended Cuban control by monied interests. Essential social services remain one of his most important achievements. Article 50 of Cuba’s Constitution mandates “the right to health protection and care” for everyone. By “providing free medical and hospital care by means of the installations of the rural medical service network, polyclinics, hospitals, preventative and specialized treatment centers. (F)ree dental care. Promoting the health publicity campaigns, health education, regular medical examinations, general vaccination and other measures to prevent the outbreak of disease. Castro virtually eliminated illiteracy. Students learn math, reading, the sciences, arts, humanities, social responsibility, civics and participatory citizenship. Giving them skills to become more productive citizens. Able to contribute to national development. Despite embargo conditions, Cubans get nutritious food at affordable prices. Cuba’s Law Number 49 mandated government provided social services. Including special help for Cuba’s elderly, disabled, others unable to work and single mothers. Cuba’s Public Health Law mandates protecting the health of all citizens. Including those rehabilitating from physical or mental disabilities. Its healthcare is among the world’s best. Including an extensive system of family doctors. Sophisticated tertiary care facilities. Emphasis on nutrition and preventive care. Cuba’s low infant mortality rate bests America’s. Matches its life expectancy. Has double the number of physicians per 1,000. An overall lower mortality rate. No one lacks care because of affordability. Polar opposite America’s “pay or die system,” according to Ralph Nader. Maintains the developing world’s most extensive infant immunization coverage. Emphasizes chemical-free, non-GMO, organically grown fresh produce. Delivers top quality healthcare at minimum cost. Compared to America’s exorbitant system. Double the cost of other developed countries. Leaving millions uninsured. Despite claims otherwise. Millions more underinsured. One major illness for many away from bankruptcy. Impossible in Cuba. With top quality universal care for all. No one denied what’s needed. Key are hundreds of community-based polyclinics. Serving tens of thousands of Cubans. Organizational hubs. For neighborhood-based family doctor/nurse offices. Accredited research and teaching centers. For medical, nursing, and allied health sciences students. Backbone of Cuba’s health system. Shaming America’s for millions of its most disadvantaged. Most Cuban doctors practice general medicine. Mandated for most medical graduates. Later able to specialize. Polyclinic care largely replicates what’s available in hospitals. Services include x-rays, ultrasound, optometry, ophthalmology, endoscopy, thrombolysis, emergency services, traumatology, clinical lab services, family planning, emergency dentistry, pre and postnatal child care, immunization, diabetic and elderly care, as well as rehab. Other specialties include dermatology, psychiatry, psychology, cardiology, family and internal medicine, pediatrics, obstetrics, and gynecology, mouth disease, acupuncture, message therapy, electromagnetic therapy, mud therapy, reflex therapy, heat therapy, speech therapy, physical therapy, and more. Quality care is stressed at all times. So is patient satisfaction. Cuba considers healthcare a human right. America provides it on the ability to pay. Commodified for profit. Insurers, drug giants, and large hospital chains make policy. Cuba has state responsibility for healthcare. Assuring availability for all. Regardless of financial well-being. How all systems should be run. Its physicians complete a nine-year program. Including five years of basic education. One-year hospital internship. Three rural practice years. Family medicine stressed. So is preventive care. Doctors wanting to specialize must complete three more years of training. Abide by Cuba’s model health code in treating patients. Exclude private practice. Follow government policies. Emphasize prevention and human welfare. Work for national wellness. Profit is America’s only goal. Other objectives are secondary. Cuba spends a minute fraction per capita annually. Compared to what healthcare costs in America. It sends thousands of doctors to dozens of countries needing them. Offers free medical education to thousands of students. From scores of countries. In return for providing their people Cuban-style care. Largely in under-served communities. Its model shames America’s. It works because it’s fair. A testimony to Fidel’s legacy. Along with high-quality free education. Other vital social services. Ones Americans can’t even imagine.